Do you know this Highly Nutritious & Naturally Low Calorie Fruit? If you are looking for a highly nutritious, low calorie food then cantaloupe may be what you are looking for. Naturally low in calories cantaloupe comes in at only 56 calories per serving, and is also a great source of vitamins A, B3, B6, C, folate, potassium, and dietary fiber. The high amount of vitamin A has been thought to help, repair lung tissue. Cantaloupe has over 100% of the daily recommended level of vitamin A needed. So one simple serving of this sherbert orange melon and my A for the day is complete. Chances are you will have more then one slice or serving. 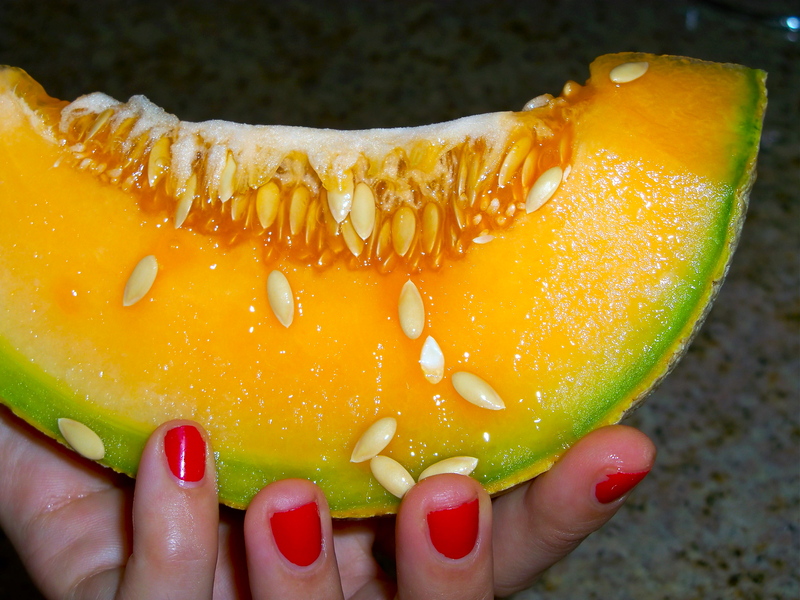 Cantaloupe contains high amount of beta-carotene, which turns to vitamin A in the body. The vitamins and antioxidants are also a great help in improving and aiding vision. A recent study of 50,000 women confirmed that women who got the most vitamin A reduced their risk of cataracts by 39%. We all want to be away from the risk and simply implementing your diet with some food related Vitamin A is very helpful in keeping your body healthy and happy. The high amount of vitamin C in cantaloupe is 100% of the daily recommended amount needed. Vitamin C can support the immune system and protect the body from the cell damage caused by free radicals. Not only does vitamin C offer antioxidant protection, it also, decreases the risk of cancer, heart disease and stroke. The B-complex vitamins in cantaloupe help our bodies process carbohydrates and the fiber content assures the carbohydrates will be absorbed slowly by the body, stabilizing blood sugar levels. This is good news for those watching their weight, as well as people with diabetes. A research study at Kansas State University showed that if you eat foods rich in vitamin A, such as cantaloupe, you could reduce your risk of emphysema and lung cancer. Researchers found that benzo(a)pyrene, one of the carcinogens in cigarette smoke causes a deficiency in vitamin A. Increasing your intake of vitamin A can rectify this problem and prevent the onset of emphysema and cancer. Scientists believe that the reason some smokers can live well into their 90s is because of their vitamin A consumption. They even recommend that if you smoke or have a friend who smokes, start eating foods like cantaloupe which are rich in vitamin A. Others who should start eating cantaloupe and increase their consumption of cantaloupe, are people who are at risk for age-related macular degeneration. Eating three servings of fruit every day is a good way to prevent this eye disease. Many people don’t know that cantaloupe has more potassium than a banana. Because calories in cantaloupe are so low, you won’t have to worry about eating too much. The fiber content will help aid digestion. This is also a benefit when it comes to weight loss. People who feel full do not eat as much each day. Make sure to choose a cantaloupe which is as ripe as possible. It should not have a stem and should feel heavy. The skin should have a slight give to it when you press down on it. It should also have a nice sweet smell. Cantaloupes are among the many fruits that will continue to ripen after they have been picked. When a cantaloupe is fully ripe, it should be placed in the refrigerator. We loved your website so much we added it to our sites.